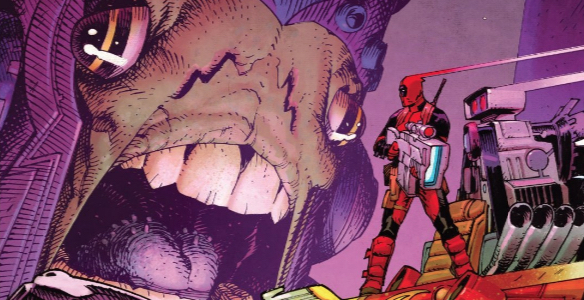 Deadpool is a mercenary, assassin, sometimes hero, and fourth wall-breaking jokester. But after nearly 30 years of quips, kills and general raunch Deadpool has become something else entirely: a lens to see the Marvel Universe through. Deadpool has a funny effect on the characters and setting surrounding him — he Deadpoolifies everything he touches. 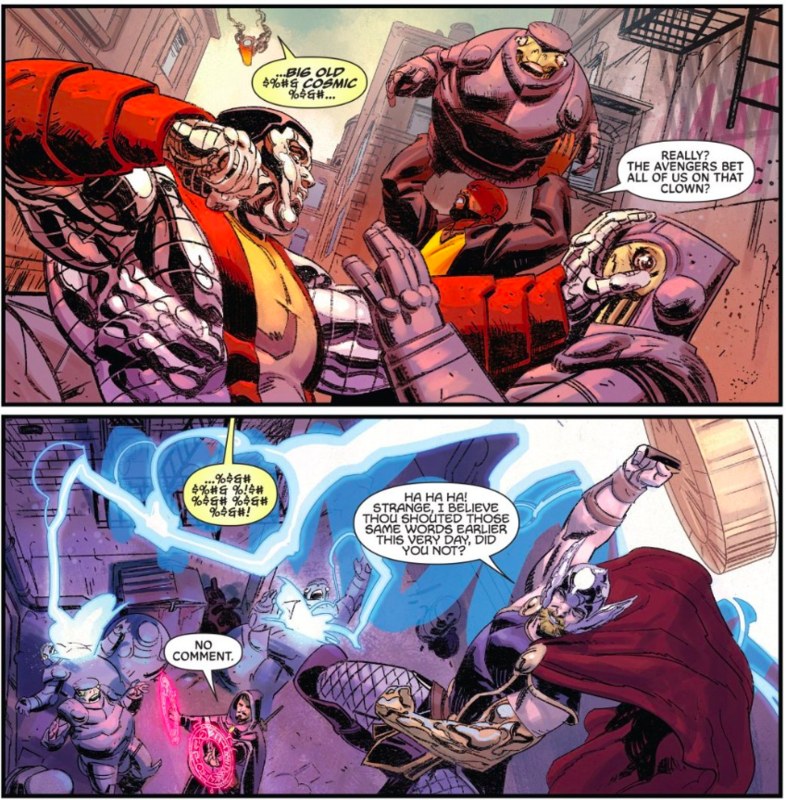 I’m sure that you could dig up an issue of where Stephen Strange swears like a sailor with all of the expletive fillers you can throw on a page, but it feels inherently Deadpooly to me. Every time Bruce Banner Hulks out, all of his clothes are destroyed save his purple short pants. Klein applies that universal rule to Deadpool, instead discarding all of his clothing save his mask, gloves and boots — with a little Deadpool logo covering his nethers. This has happened in previous issues and occurs twice in Deadpool 3, with Wade calling attention to it. 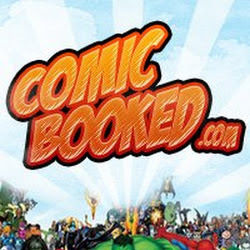 Another Deadpoolish affect of Deadpool 3 is “Roxxon News”, who covers Deadpool’s victory of saving the city. For the uninitiated, Roxxon is basically Marvel’s “Evil Incorporated,” responsible for everything from pollution to countless acts of murder. Having a news organization run by Roxxon then, is a great gag. Unfortunately with the world we are living in with Fox News, Breitbart and the like, Roxxon News isn’t something completely outlandish. 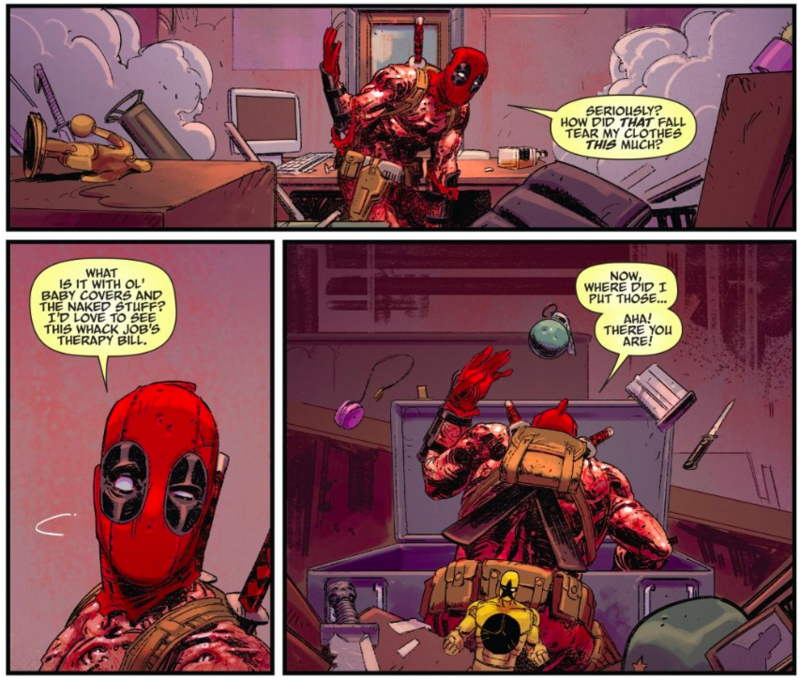 If Gerry Duggan’s Deadpool was incorporating Wade into the larger Marvel Universe, Skottie Young’s is conforming the Marvel Universe into Wade’s world.